The Refined Geek » Lake Vostok is a Scientific Boon, No Matter What We Discover (or Don’t). Lake Vostok is a Scientific Boon, No Matter What We Discover (or Don’t). Life is a strange thing. No matter where you go on Earth as long as there’s water you’re guaranteed to find some form of life there. Current scientific theory posits that the reason behind this is that after the initial conditions were met to instantiate life it then set about diversifying itself into many environments in order to out-compete its rivals and become the dominant species in its chosen niche. As far as we know it’s nigh on impossible for life to originate in some of the conditions we find it in and some are just so inhospitable that we don’t believe life could sustain itself in such conditions for any reasonable amount of time. 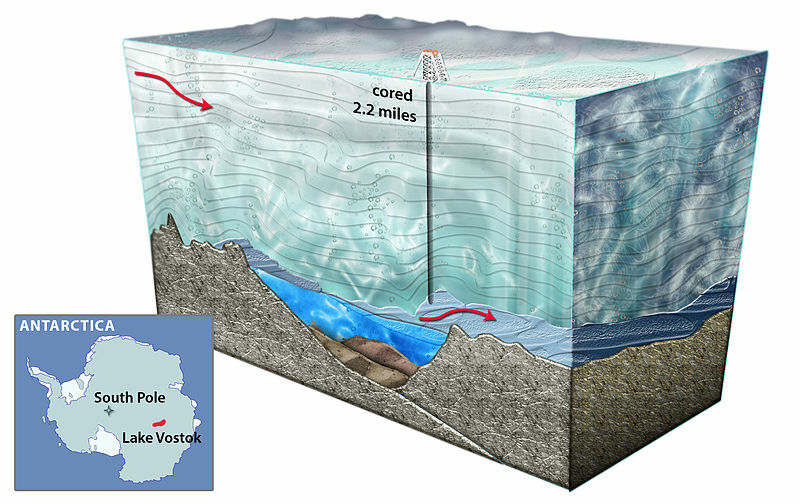 One such location is Lake Vostok a body of water that’s buried beneath some 4KMs worth of ice. Based on radar imaging of the ice flow we believe that this particular lake has been cut off from the outside world for some 15 million years although the water is probably closer to 13,000 years old, due to the flow of ice around it. The water at the bottom remains liquid due to the enormous amount of pressure bearing down on it from the several kilometre thick ice sheet above it even though its average temperature is about -3 degrees centigrade. The water there is also unlike any other water in the world containing about 50 times the amount of dissolved gasses (mostly oxygen and nitrogen) making it quite a unique environment. It’s interesting for a couple of reasons, the most important of which is whether or not there is life down there. The conditions are extremely inhospitable since no sunlight reaches it, the temperature would kill most microbial life and due to its isolation from the outside world it’s likely to be very nutrient poor. Now it’s not like we haven’t seen conditions like this before and then proceeded to find life there (indeed there’s a whole classification dedicated to these types of creatures: Extremophiles) but the question of whether or not there’s life in Vostok is important due to its implications. If we find life there, we have a few other places in the solar system which could be worth investigating. This is why the scientific community erupted in a clamour of joy recently when scienticists from the Lake Vostok outpost announced that they had found life in their drill samples and it contained DNA that was only 86% similar to current life on Earth. Discovery of such an alien form of life would mean there’s a good possibility that the oceans under the surface of our gas giant’s frigid moons might also contain similar levels of life. It would then open the path to missions like Cryobot which, up until a discovery like this, were scientific long shots that have a hard time justifying the giant budgets required to make them a reality. Unfortunately though the announcement was somewhat premature as the bacteria discovered has turned out to be a contaminant putting the kibosh on all the excitement. It’s an unfortunate symptom of scientific reporting as the results had not yet gone through peer review which is designed to catch mistakes like this. It doesn’t mean the work they’re doing there is all for naught though as it simply means that they need to be more cautious before releasing information lest they cause another stir like they just did. Problem is without public interest its hard to keep things like this funded which is what causes scientists to release early results before the proper peer review process can take place. However even if they don’t find life down there that will still be something of major scientific significance. As I said before we seem to trip over life wherever we go on this planet and so the current upper and lower bounds on where it can exist are a little fuzzy. Finding a place on earth where life simply can’t survive would mean that we could focus our efforts on the search for life elsewhere and potentially not spend ludicrous amounts of money and time foraging for life in places which it simply would not be able to exist in. We’re still a fair way off from knowing either way on life in Lake Vostok but no matter the outcome it will still be worth pursuing. I feel the scientist’s pain on this one, I really do. On the one hand you want to do solid, valuable science that will be a major influence on future studies. However by the same token you have to generate enough interest in your area in order to secure funding to keep doing just that and that puts a lot of pressure on you to release results like this before they’re ready for prime time. Thankfully the scientific process works to ensure that inaccurate information doesn’t remain like that for long.